I feel like, in general, lefties hit fastballs from right-handed pitchers better than right-handers hit fastballs from right-handed pitchers. So if you look at how I pitched them last time, I threw more fastballs to their righties and less fastballs to their lefties. And they had more lefties on those teams. So it ends up being more off-speed to that team because of the amount of lefties they have. But, you got to probably make somewhat of an adjustment because you can't just keep doing the same thing to a team, or else they'll make the adjustment and get a couple runs and it will be too late. So I have to find a way to mix more fastballs in against them this next time probably. So, he is obviously working on figuring out how he'll approach Mets batter from inning to inning and from game to game, and that's certainly the right approach. What I find even more interesting is how much input and research he ultimately puts into every start, and thankfully we got a great glimpse of this in a recent article in the Wall Street Journal by Brian Costa; "Baseball’s Most Obsessively Prepared Pitcher." Before a single instruction is conveyed to the Dodgers infield, Greinke meets with Wallach himself. He arrives having already studied charts illustrating the paths of each hitter’s batted balls. Then, after considering how his pitching plan against each hitter might affect their tendencies, he essentially decides where his teammates will stand himself. Wow! Greinke uses sabermetrics to situate fielders in the best possible location, and by doing so can tailor his pitches to insure that he creates a desired outcome. This guy is like a maestro who's conducting as masterpiece every time he is on the mound. 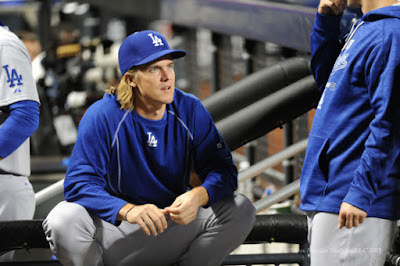 Via Jon Weisman at Dodger Insider, "Despite knee issues, Turner expected to start Thursday." Grandal, on the other hand, is iffy, via Jon Weisman at Dodger Insider: "Yasmani Grandal ’50-50′ to start NLDS Game 5." Via Greg Johns at MLB.com, "Postseason ride a family affair for Seagers." "I couldn't be prouder or more happy for him," Kyle (Seager) said. "It's an extremely exciting time for not only me, but our entire family." Via Ken Gurnick at MLB.com, "Van Slyke says he's available if Dodgers advance." I suppose this is proof that not everybody in the Dodgers organization is transfixed on the playoffs. Via a press release, they have claimed right-handed pitcher Brooks Brown from the Colorado Rockies... And, no he is not eligible for the playoffs. Brown, 30, has gone 1-4 with a 3.97 ERA in 64 career relief appearances with the Rockies in 2014-15. The University of Georgia product was limited to just 36 games this past year due to right shoulder inflammation after posting a 2.77 ERA with a .208 opponents’ batting average and a 0.96 WHIP in 28 games in his rookie season of 2014. He was originally selected by Arizona in the first round (34th overall) in the 2006 First-Year Player Draft. I couldn't agree more with Murray Chass; "Welcome to the Wimpy World of Baseball." Panini has release preview pics of their upcoming 2015 Elite Extra Edition Baseball set; including the Julio Urias card on the right. Go here to check out more pics. The set hit stores just before Christmas. Here's a brand new online exclusive product direct from Topps. It's called 2015 Topps Vault Originals and it features a pack with a single autographed 5"x7" card using unique photography found in their vaults. Check it out here. A pack will cost you $99.99. The checklist is small (just 41 different cards), and they are numbered to 99 or less. It also includes four different Dodger players: Eddie Murray (as a Dodger! 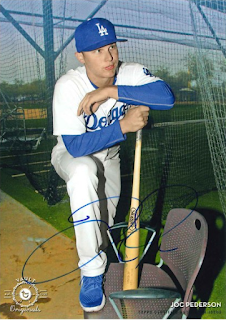 ), Fernando Valenzuela, Joc Pederson and Mike Piazza. Check out the Pederson below. As soon as I track down pics of the other cards I'll share them in a blog post.